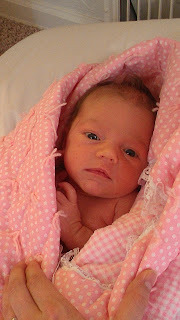 Our sweet little girl made her appearance on Friday Feb. 3rd, 2011 at 2:43pm. I was induced right on her first due date (her second one was Jan. 31st). We went in at 7:30 am and i was started on antibiotic (because i was strep B positive). Those had to be in my system for 4 hours. Around 12:30pm the doctor came in and broke my water and turned the pitocin up. Up to that point i was having very regular contractions, but they didn't hurt. After he broke my water, they started to become painful. about an hour later they checked me and i was dilated to 6cm and about 5 mins later the pain got drastically worse. I kept thinking to myself "If this is only a 6, i can't do this". 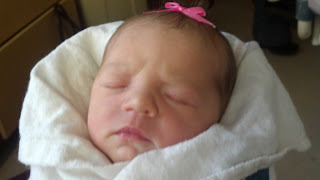 I had planned on going natural, and avoid having an epidural at all costs, but this pain was unbearable. I couldn't imagine it getting any worse. So tearfully i asked them to send the epidural guy. As my next contractions came, i couldn't believe the pain. Just then, the baby's heartbeat wasn't registering on the monitor. For about 5 mins the nurse was trying to relocate it, and then she started to panic a little. I felt her hands shaking. All i could focus on was her, and the fact that they couldn't find the heart beat. I kept asking if she was ok, and why they couldn't find the heartbeat. I started to panic along with the nurse and they had to put some oxygen on me. The nurse pushed the call button and said, "I need some help in room 5!" A team of nurses and a doctor came in and they started to try and help the nurse to see if everything was ok. Finally they put an internal monitor that screws into the top of the baby's head (just the skin) and the heart beat was found. It was the best sound in the world. As they put in the monitor, the epidural guy came in. He tried to ask me questions but i was so delirious that i couldn't answer him. The nurse then informed us that i was fully dilated. The epidural guy stated that is was too late for him to help, and he left. I then got the urge to push. They tried to get me to wait for my doctor, but i couldn't wait! Minutes later my doctor walked in and after about 10 mins of pushing she was born! Just a little over 2 hours of actual labor--- not bad! We named her Elle Jae Beagley. She was 6lbs 13oz and 20 inches long. She is perfect! We love her so much. She is the greatest blessing in our lives. 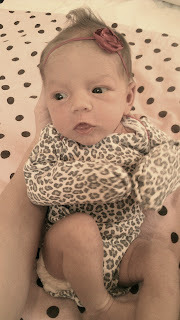 It's so amazing how you can instantly love someone as much as we love her. It's very humbling that Heavenly Father would trust us enough to let us raise this precious soul. All the panic and pain was so worth it and i would do it again any day to have her. She eats well, sleeps well, and is growing like crazy. 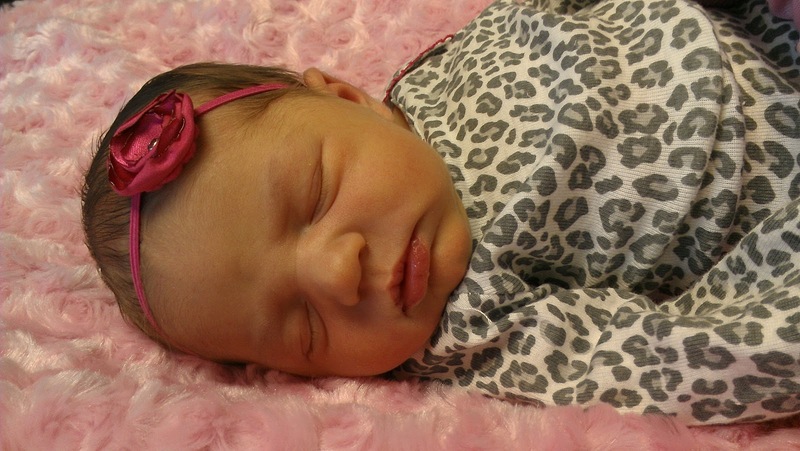 At her two week appointment she was weighing 7lbs 3oz and was 21 inches long. She is beautiful! Glad both mommy and baby are doing well! Wow! What an amazing story! You are CRAZY to go natural!! That's so scary they lost her heartbeat! But I'm glad everything went well and as planned. You're lucky you only pushed for 10 min!!!! And Jax was that same size a month early so she's just a little thing isn't she? I hope I can meet her someday! She's beautiful!! !